Ken Kaneki is a quiet bookish type who admires a young lady by the name of Rize Kamishiro from afar until she notices he likes a favourite author of hers. They have a cute date and all seems to be looking up for Kaneki – then Rize takes a bite out of him. She happens to be a Ghoul, a flesh-eating creature that lives secretly among humans and she plans to make Kaneki her next meal. Suddenly a freak accident occurs, killing Rize and badly injuring Kaneki, but his life is spared at the cost of turning him into the very creature that tried to kill him in the first place. When a manga or anime series becomes hugely popular, it’s a natural progression in Japanese media to make a live action adaptation, whether it be via film or TV. Examples include – but are not limited to – Attack on Titan, Sailor Moon, Death Note and now Tokyo Ghoul, based on the acclaimed series by Sui Ishida. Both series of the anime, the Tokyo Ghoul manga and first 2 volumes of its sequel manga (Tokyo Ghoul:re) are currently available in the UK, and now All the Anime has kindly brought its latest incarnation to UK cinemas for 2018. For fans, live action versions of anime/manga can provoke a mixed reaction, as they don’t always do the original material justice; is Tokyo Ghoul doomed to suffer the same fate? As the original story was told over 14 volumes, or 24 anime episodes, the nearly 2-hour movie has no choice but to condense a lot of the plot, and even then, it only covers the first story arc until just before the infamous ghoul Jason is introduced and we reach the major turning point for Kaneki’s character. The good news is that a lot of the emotional highlights are kept in this version. Kaneki’s struggle to accept his new ghoul diet is still incredibly hard to watch as he tries (and fails) to eat human food, and then fights against himself for what his darker side wants him to become. You also get a sense of the ghouls as a community within the café they seek shelter in, even though their relationships are not as defined, and the CCG feel as threatening as they do in the original. The bad news is that due to the time restraint we completely lose the morality questions and shades of grey the ghoul and human sides had; every character is now two-dimensional, so the high melodrama that was fascinating and had something to say in the anime and manga now plays more like a cheesy horror flick that’s out to show the gore and reveal when the main character gets dragged onto the dark side. It also doesn’t help that we have no sense of scope of the world outside of the main core cast; there are brief mentions of the current ward they’re in and we see the CCG offices but the world building is on a far smaller scale and doesn’t have the same impact. There’s also no detailed explanation as to what a ghoul’s ‘kagune’ is or how they work, or anything about how they co-exist in the first place. Fans of the original material would, obviously, be able to insert their own knowledge into the movie itself but everyone else won’t have much else to go on. There are also many side characters that are either written out entirely, or dropped mid-way through the movie way before they were in the original story. But to give credit where it’s due, at least the movie has a proper conclusion, an emotional wrap up that has enough room for a sequel (if it ever comes) but doesn’t leave the audience hanging, unlike the ending to the first anime season. Another highlight of the film is Masataka Kubota; if you’re a J-drama watcher then you’ll recognise him as Light in the J-drama version of Death Note, so Kubota has experience with playing darker, emotionally and mentally complex characters. He plays both Kaneki’s softer, quieter side and mindless ghoul mode, extremely well. So much so that his performance often compensates for the weakness of the writing in various scenes, where the fight between his ‘human’ and ‘ghoul’ side is played too quickly in the movie to be believable, but Kubota sells it regardless. You could argue that his experience with more ‘soap’ stories comes across slightly here, however as the melodrama is played up in the movie version, it works within the context. Due to the nature of Ghoul’s main physical attributes and attacks, the movie relies heavily on 3D, and throughout the movie it’s a mixed bag. Early on, when we get close-ups of the Kagune and the impressive sound-work gives them creepy, vibrant effects, making them feel ‘alive’ on screen, it’s very effective. You can also see a lot of work has gone into designing them: all the scales, pulsing, and small details are there so when they’re slow or still, they truly look impressive. In motion however, it’s hard not to chuckle at the laughably bad CGI; when it tries to replicate the human characters and make them move swiftly mid-battle, they just look like rag dolls! The movie does, however, try to compensate by having a few unique fight scenes, there are some ripped straight from the source material but there’s a couple that provide an entertaining watch due to how they’re choreographed, even if the CGI isn’t up to scratch. The Tokyo Ghoul live action movie isn’t a replacement for the original story or recommended as a gateway into the material, as it drops a lot of what made the story so compelling in the first place. But for fans this can provide an entertaining ride, with interesting visuals and good acting that tries to bring the story alive, even if it doesn’t always succeed. 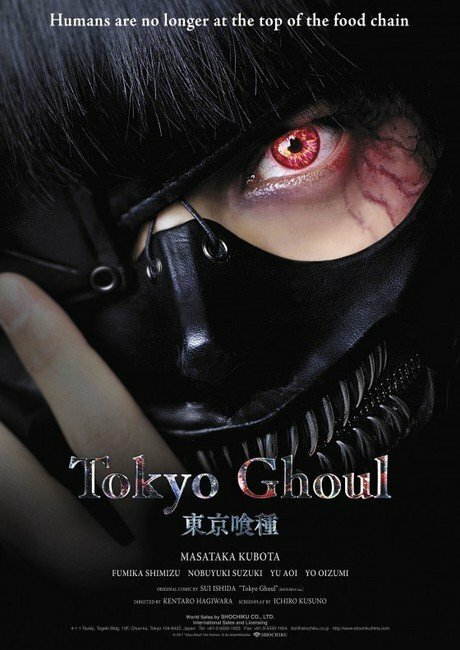 Tokyo Ghoul is in cinemas 31st January by Anime Limited; for full list of cinemas and to purchase your tickets, click here. Overall this live action adaptation of Tokyo Ghoul is an enjoyable watch. It doesn’t necessarily have the same pull as the original manga or its anime adaption but for existing fans it’s interesting to see the story adapted in a different way.